If you look at the World Trade Center Site on Google Maps, you will see Google still labels it, "September 11 Attacks." An upset Google Maps user posted his distaste for such a label in the Google Maps Help forum. 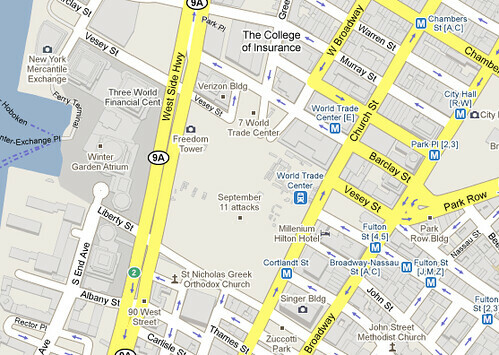 I noticed on the map of lower Manhattan, the entire former WTC area is designated as "September 11 Attacks." Surely this is more of an event than a geographical location? It's been 8 years, and I was just wondering if this location could be called something more appropriate for a map, such as "Former WTC Site" or "Future Freedom Tower Complex"? Dealy Plaza in Dallas is labeled as "Dealy Plaza," with a photo icon that tells the story of JFK's assassination. The location is not called "JFK Assassination." The case is similar with Pearl Harbor. To my surprise, a Googler replied saying, "Thanks for bringing this to our attention. This seems to be the result of an over-eager algorithm. I'll look into getting it fixed." Again, Google will look into getting it "fixed." I guess it can not always be labeled September 11 Attacks but what should it be labeled?